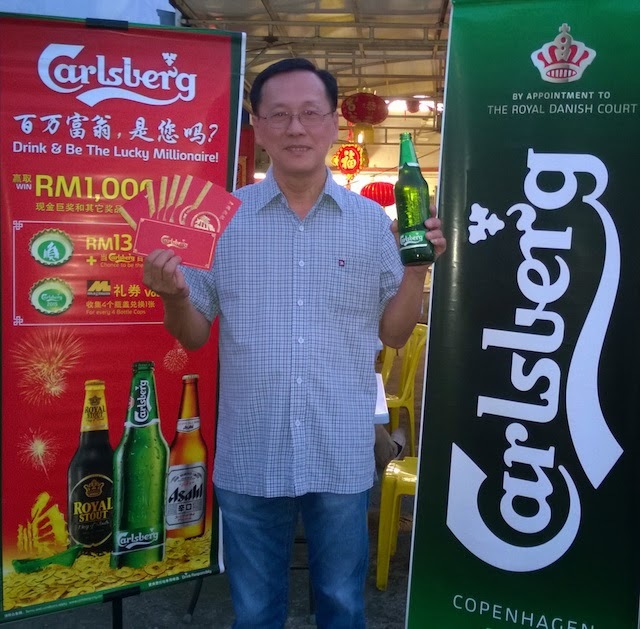 For lucky Carlsberg consumers, 2015 is proving to be a lucrative start as seven potential millionaires sailed smoothly into an unexpected windfall of cash prizes worth RM13,888 each thanks to the brand’s Chinese New Year promotion. This definitely marks a smooth start to the Year of the Sheep for the seven finalists as they now gear up to compete against 31 other ‘Carlsberg Millionaire’ hopefuls to take home RM1 million in cash come March. 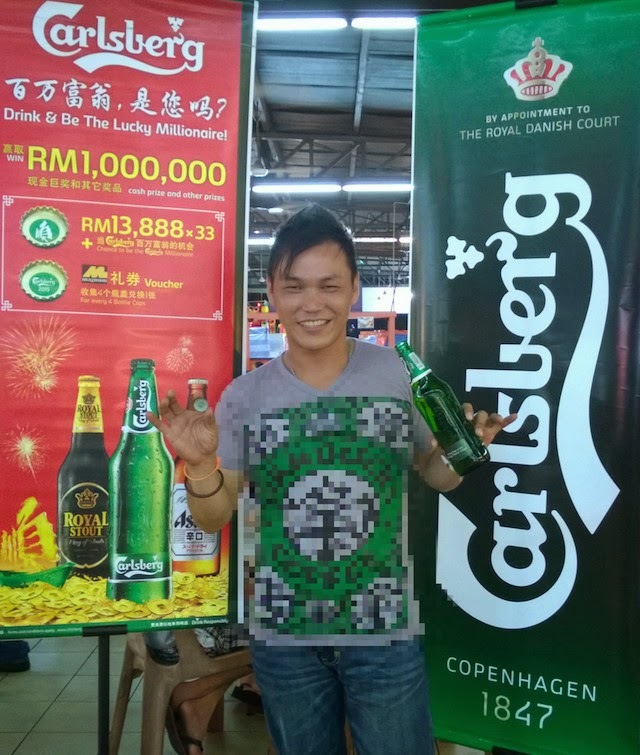 See Seng Hong, a potential 'Carlsberg Millionaire' poses with a large bottle of Carlsberg and custom 'ang pows' from the brewer..
Other winners who also received the windfall of RM13,888 from Carlsberg are Chua Boon Siang, 39, Lee Hin Hee, 43, and See Seng Hong, 64. Until February 28, 2015, consumers who enjoy any large bottle of Carlsberg, Asahi Super Dry or Royal Stout at participating restaurants, food courts, hawker centres and coffee shops just need to look out for the Chinese character for ‘Smooth’ (順) on their bottle caps in order to be in the running to win a RM13,888 cash prize. Alternatively, consumers who purchase a 24-can Carlsberg Festive Pack from participating supermarkets and hypermarkets simply need to check for the congratulatory message printed at the base of the tray to discover if they will be walking away with RM13,888 in cash and a chance at the Grand Prize. Consumers who purchase a 24-can Carlsberg Festive Pack also stand to win shopping vouchers worth RM200 to kick start a prosperous lunar new year. All 38 winners of the RM13,888 cash prize will attend a special celebratory event in Klang Valley to find out who amongst them will become the first ever Carlsberg Millionaire and receive the Grand Prize of RM1,000,000 in cash and sail smoothly into the new lunar year with Carlsberg. For more information on the Carlsberg Millionaire Contest and other festive activities lined up, visit www.carlsberg-cny.com.my or www.facebook.com/CarlsbergMY.